Over the many years living here in Wisconsin I have had the wonderful pleasure of fly fishing many of the trout streams in Central, Northeast and Northwest Wisconsin. Rivers like the Wolf, Phestigo, Pine, Namekagon, Bois Brule, White River to name just a few. Each river has its unique characteristics and charm. Whenever I am fly fishing on one of these rivers I easily get lost in the peaceful woodland surroundings and for a few hours forget about the Internet, cell phones and the rat race in the cities. Let us hope we can preserve these wonderful places for generations to come. 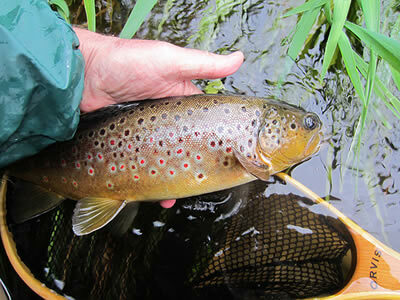 I have also fly fished for trout from Maine to Idaho. Rivers like the Battenkill and Delaware River in the East and the Henry's Fork, Snake, Yellowstone, Madison, Firehole, Big Hole, Clark Fork and Rock Creek in the West. The three rivers I have enjoyed the most are the Delaware River along the New York-Pennsylvania border, the Namekagon River in Northwest Wisconsin and the Henry's Fork in Last Chance, Idaho. In my younger days I had the pleasure to meet and fish with some of the finest trout fly fishermen of our time. I met Al Caucci and Bob Natasi on the Namekagon River at Seeley. Al & Bob are the authors of Hatches II and Instant Mayfly Identification Guide. Both books are excellent mayfly references and should be in all serious fly fishermen for trout book collections. While staying with Al & Bob at the white house that they use to rent on the Delaware River (now it's part of Al Caucci's Delaware River Club) I got hooked on the comparadun flies and I have been using them ever since. Bob Natasi taught me to watch the foam line to help spot where the biggest trout will feed during a good hatch. I met Eric Peper shortly after meeting Al & Bob on the Namekagon River and Eric has been my closest fly fishing and bird hunting partner ever since. Eric was also a good friend of Al & Bob. Thanks to him I have spent many hours fishing rivers I probably would have never experienced on my own. Eric is an extremely knowledgeable fly fisherman as well as an outstanding fly caster and a fly tyer. He introduced me to Gary LaFontaine who was an absolute trout fishing fanatic and knew more about the trout and their habitat than anyone I had ever met. His books are still some of my favorites and anyone serious about improving their fly fishing tactics and skills for trout in streams should read Gary's books. 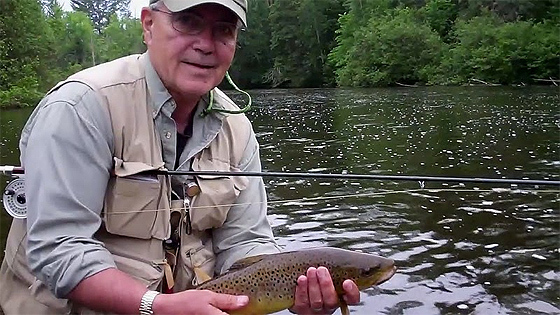 As an avid fly fisher for many years I hope this web site will help others to explore and enjoy some of our finest resources - Wisconsin's wonderful trout streams and the magnificent wild trout that live in them. Remember too, it's our job to help preserve these great natural resources for generations to come. Enjoy!